Podcasts for Educators. Podcasts by Educators. Google Apps for Education is now G Suite for Education and the education world is losing it·s mind! We are a podcast network that encourages you to think about your profession and succeed in the world of education. Whether you are a first year educator or a seasoned veteran there is podcast for you. 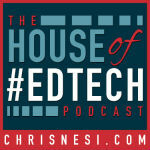 Copyright 2015- Education Podcast Network. All Rights Reseved.